While fiddling with Charon's fonts and wondering what work would be involved to replace the whole set I decided to take a quick look at the freetype module. This lab documents some of my progress. A recent post to the acme-sac mail-list pointed me to the DejaVu fonts. They are derived from Bitstream Vera Fonts but with more characters. It includes various styles: Sans, Serif, Italic, Oblique, Bold, and Mono, making it a good choice for Charon. At first I considered converting the whole set over to Inferno format. There is a program to convert TrueType fonts to the inferno format. But the program is designed to run on Plan 9 and I don't have a ready Plan 9 environment anymore. So the effort of setting up an environment, compiling and fixing problems I know exist in the conversion tool, creating font files for all the styles, and in a variety of sizes, and I was ready to look for an easier solution. 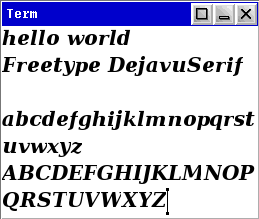 The Freetype library is compiled into the inferno-os emulator and exports a builtin limbo interface. There are no programs in inferno-os that use Freetype. And there is no documentation describing the limbo interface. There have, however, been a few posts to the inferno-list describing its use. Also, the Freetype documentation from its source website is good. The tutorial basically describes what needs to be done within inferno to use the freetype module. The first example from inferno-list, testfreetype.b, shows the use of the library for rotation and scaling. 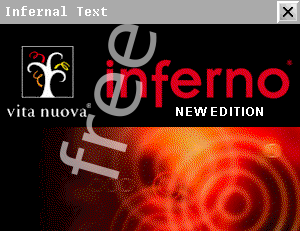 In this screenshot, the Inferno logo image is the background, and the word 'freetype' is scaled and rotated above it, with some transparency. Its not documented in Inferno, but see the Plan 9 manual page. Once I got that baseline working, the next program is frame2.b and term2.b that uses freetype. In the init function I load the freetype module and load a new face. I rewrote the three functions used by frame to display strings, stringx, charwidth, and strwidth. Stringx does the work of loading the glyph and drawing it. Acme uses frame so we can quickly experiment with using a TTF file for the Acme font. The above three functions are in another module in the acme source called graph.b. I've included a graph2.b file in this lab that can be bound over the existing graph.dis and will load a hardcoded TTF file for the font. 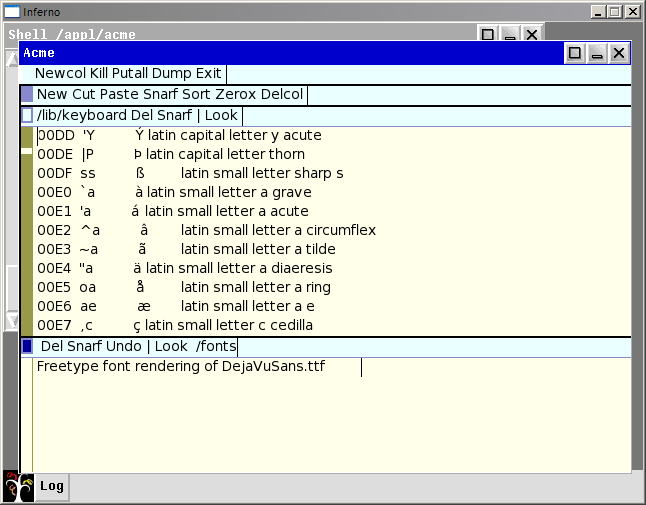 Below is a screenshot of acme running the DejaVuSans.ttf font. Now back to my original aim: changing the charon fonts. I created a module that defined a new Font ADT to replace the one defined in the draw module. I changed the interface slightly, to include the freetype face and added the stringx function. % bind -bc '/n/local/inferno-lab/91' . And here is an screenshot of the results. I haven't looked at converting Tk. thanks for this lab caerwyn. i checked whether indic languages are rendered correctly using graph2.b. it turns out glyph substitution is not supported by freetype and is implemented elsewhere.